With the shining sun and warmer temperatures that we’ve had for the past four days, I am cautiously optimistic that Spring truly is just around the corner. I was worried that we’d actually have snow for Easter. Truly. Honestly, though, it doesn’t really matter what the temperatures are: Spring begins tomorrow. To celebrate, I made fun Easter cupcakes with my kids. I put Shelby (12) in charge of making the cupcakes, Keilie (15) in charge of covering the strawberries, Tyson(9) in charge of Oreos and frosting, and Brennon (11) in charge of creating, all while I supervised. I love foods that double as crafts. Especially when it tastes as good as it looks! Before you begin, wash and dry your strawberries. Whether you use the microwave, a double boiler, or our method, a glass bowl submerged in a pan of water, melt your chocolate wafers. Helpful hint: You want to melt the wafers slowly, over very low heat, to help it stay at its smoothest consistency. It’s also incredibly important to not get ANY moisture in the pot with your wafers. As soon as the wafers are completely melted and smooth remove the pot from the heat. You’re ready to start dipping your strawberries. Holding the stem of your strawberry, gently to not break it off, dip the strawberries far enough to get as close to the stems as possible. Once all of your strawberries are dipped, use the excess chocolate to swipe a side-to-side pattern across each “carrot.” I’m used to being a bit more messy (as you’ll see in my Oreo Truffles post here), so it was a bit of a challenge to get them as straight as possible. They still turned out fun, though. Place the pan in the fridge to set while you make your cupcakes. 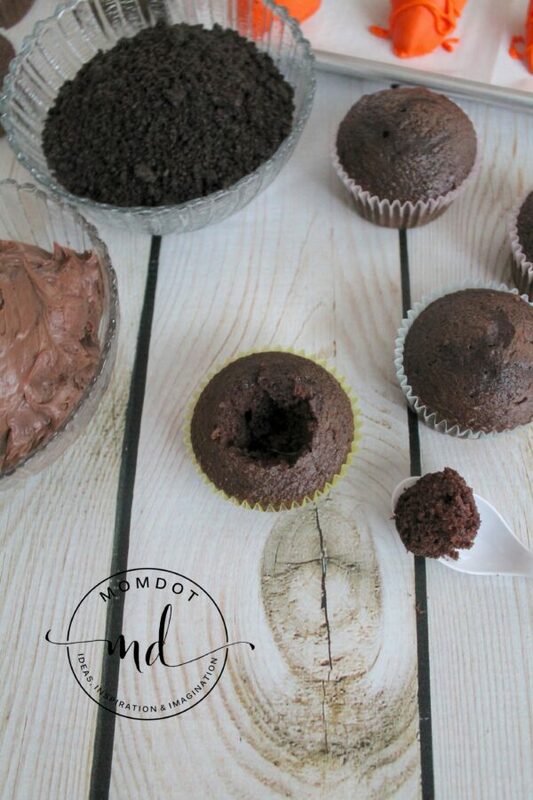 Follow the cupcake directions for either your store-bought cake mix, or my favorite chocolate cake mix here. I’m serious, you’ll never believe the secret ingredient that makes this cake so moist! Cool cupcakes completely. While the cupcakes are baking, crush up the entire package of Oreos. You’ll want them crushed into a fine powder. 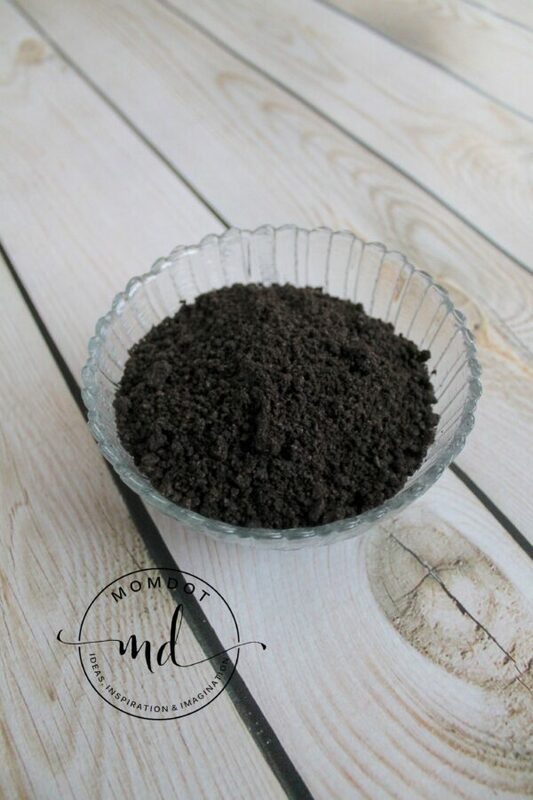 Does that not look like the most delicious “dirt” you’ve ever seen? My mouth, it waters. Also while the cupcakes are baking, make your frosting. You could use this chocolate frosting recipe, or you could shake things up and make the peanut butter frosting from my Reese’s Peanut Butter Chocolate Cupcakes here. Either would taste fantastic. With your cupcakes baked and cooled, your Oreos crushed, and frosting made, you’re ready to start making edible art! Using a plastic spoon (or anything you want, really), scoop out the center of your cupcake. You don’t need to go very wide or deep, just enough to create a resting space for your carrot. With the center removed, frost the cupcake. Don’t worry about make the frosting smooth and pretty, because the next step is going to cover it up. This was Brennon’s favorite part! 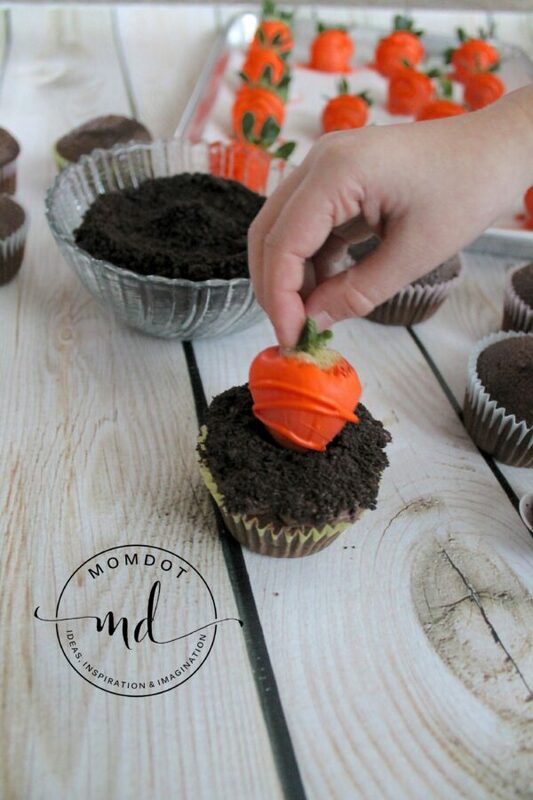 Work the cupcake around to get as much of the “dirt” as possible. Last, add the chilled jewel: Your carrot. Repeat these steps for as many Easter cupcakes as you have chocolate covered strawberries. Frost the remainder of the cupcakes without scooping out the centers, adding the textured goodness of the Oreos if you choose. Personally, I’d wait to add the Oreos until right before eating, so they stay crunchy. I hope your Spring is blooming as gloriously as mine! Hippity-Hoppy Spring, my friends!